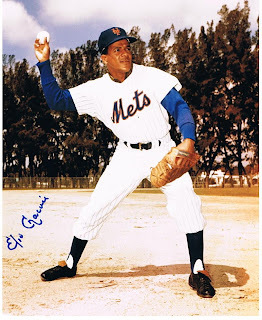 Elio Chacon Rodriquez was born October 26, 1936 in Caracas, Venezuela. He was only the seventh player in MLB history to come from that country. He was originally signed as an infielder by the Cincinnati Reds in 1956. He made the Reds as a backup second baseman behind Billy Martin in 1960 hitting just .185 at the end of June when he was shipped back to AAA, returning at the end of the year. Chacon was again a reserve behind Don Blasingame for the 1961 NL Champion Reds, improving his hitting to .265 with 2 HRs 4 doubles & 5 RBIs in 132 at bats. Post Season: He appeared in four games of the 1961 World Series getting three hits in 12 at bats. He hit a bloop single off pitcher Ralph Terry and came around to score the winning run of Game #2. That October he was the fourth pick of the New York Mets in the 1961 expansion draft becoming an original Met. Chgacon debuted with New York in the second game of the season at short stop. He played primarily at that position for the ’62 Mets batting .236 in 118 games. His 12 stolen bases tied for the team lead with Ritchie Ashburn. In a famous April 12th game where Gil Hodges hit a walk off HR in the second game of a double header with the Pirates, it was Chacon’s 8th inning RBI single that tied the game. It was his third RBI of the day as well. His best overall month at the plate was May, as he drove in ten runs of the 27 RBIs he had on the season. Trivia: That month, in game against the Giants in San Francisco, Chacon did a very stupid thing that ruined his career. In a play at second base, he got into a fight with the legendary Willie Mays, baseballs most beloved player. In any event, Mays ended up picking Chacon up & leveling him to the ground. 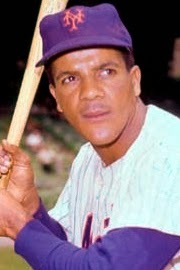 After that Chacon was pretty much black balled in his career, never playing in the majors again after the 1962 season. On the Fouth of July he hit his first Mets HR in San Francisco against those same Giants, in the second game of a double header. In a mid September series against his old Reds team mates he had five hits, including hitting his second HR of the season, off Joe Nuxhall. 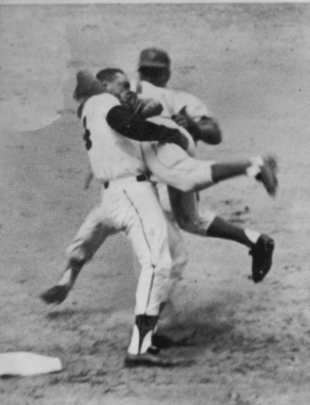 Trivia: There is a classic 1962 Mets story that has Ritchie Ashburn calling for a fly ball in the outfield yelling “I got it” over to Chacon. Problem was Chacon didn’t speak any English, and he barreled right over Ashburn. Ashburn learned to say “I got it” in Spanish, and as he was shouting that one day, he got run over by Frank Thomas who didn’t speak any Spanish! 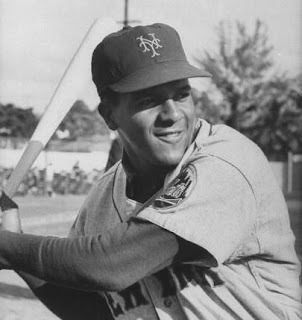 He remained in the Mets minors for two more seasons, getting traded along with Tracy Stallard in December 1964 for Johnny Lewis & Gordie Richardson. He remained playing in the minors through 1970 in the Milwaukee Brewer organization. In a short three year career Chacon played in 228 games hitting .232 with 143 hits 4 HRs 15 doubles 5 triples 39 RBIs & 20 stolen bases. Chacon passed away in Caracas, Venezuela at age 55 in 1992.